Irish Grid Reference: S 75440 76846. In a field a little to the east of the village of Browneshill in County Carlow, Southern Ireland, is the Neolithic monument known as ‘Brownshill Dolmen’ or ‘Brownshill Portal Tomb’ and sometimes as Browne’s Hill Dolmen. But it also goes under the name of Kernanstown Cromlech. The monument has a huge capstone weighing over 100 tonnes, But sadly, however, it has lost its covering mound of earth and a few of its upright supports have collapsed under the enormous weight of the top-stone, although three uprights at the front are still supporting it – two of which form the portal (entrance) to the tomb. The dolmen is located almost 2 miles east of Carlow town near the R726 road. It is best reached to the east of Browneshill village: from the R726 (Hacketstown road) at Ballinakillbeg take the footpath for 550m that heads south from the road, then heads west for quite a distance, and then north to the ancient monument – which stands in the corner of the field. Brownshill Dolmen. Photo by Sarah777 (Creative Commons). 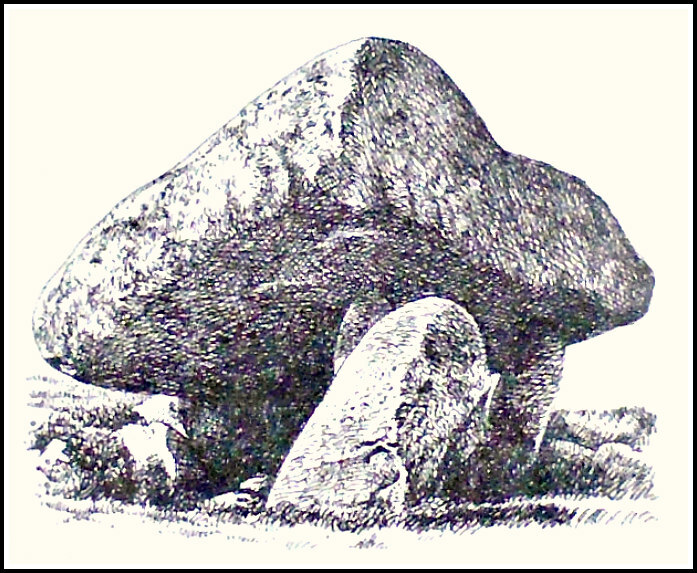 The Brownshill Dolmen is really much like a ‘stone table’ or ‘tombstone on legs’ resting horizontally (vertically) on up-right stones’; but it is also called a cromlech and portal tomb (a tomb with an entrance). 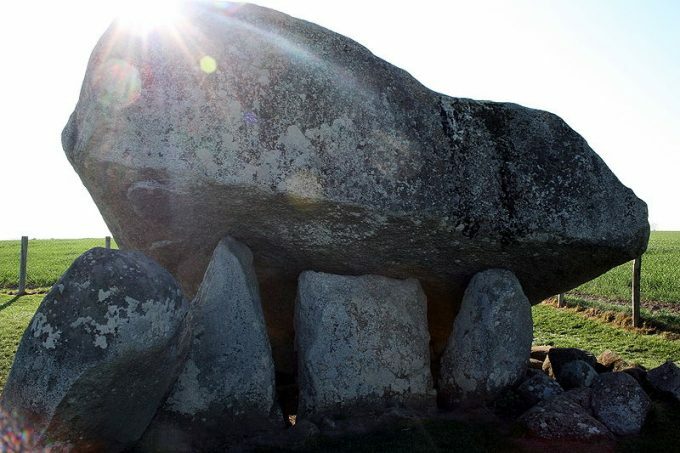 In the Nicholson ‘Guide To Ireland’, we are told that the: “Browne’s Hill Dolmen……with largest capstone in Ireland, if not Europe, 5 feet thick, 20 feet square and weighing over 100 ton. Two up-right portal stones (orthostats) support the huge granite capstone at the front, while the third supporting stone is a ‘gate-stone’ or ‘blocking stone’; these three entrance stones are between 5-6 feet high. There is a fourth stone at the front which may have been part of the forecourt, although this points at an angle away from the tomb. At the back of the monument two recumbent stones support the capstone near ground-level, but whether these two stones collapsed under the weight or were originally placed like this, is not known. I would think they were placed as such. Originally the tomb was covered by a mound of earth. The megalithic monument is said to be almost 4,000 years old and was the burial place of a Stone Age chieftain, according to Reader’s Digest ‘Illustrated Guide To Ireland’. Nicholson, Guide To Ireland, Robert Nicholson Publications Limited, London, 1983. Categories: Burial Chamber, Dolmen | Tags: Brownshill Dolmen in Co Carlow Southern Ireland | Permalink.